I sent Shelby an innocent birthday text (back on May 28th). It went something like this….what’s your favorite kind of cake? She threw me for a loop with her response. Initially I had no reason to believe that Vegan Hemp Seed Carrot Cake wasn’t exactly what she wanted. My Mom-in-action-mode took me to this recipe. Which I printed, acquired ingredients for, and assumed the holding position. But then later that day it was revealed the spawn of Chocoholic might prefer… a chocolate cake. I made the love of my life the perfect birthday cake. We got so caught up with our awesome kid and young life and birthday joy that I never posted her almost dairy free macadamia crusted chocolate torte. Be watching for it next year on or about May 28th. Flash forward to a few days before Christmas. I was going through my treasured to-be-made-recipes folder and found the recipe that I printed back on May 28th. It was thyme to make and present vegan hemp seed carrot cake delivered in the form of Carrot Cake Energy Bites. I honestly think these were one of Shelby’s favorite Christmas presents (her new hi-tech juicer a close second). The fact that I actually fell for her original request and that they turned out to be delicious bites of healthy, homemade love made them extra special. 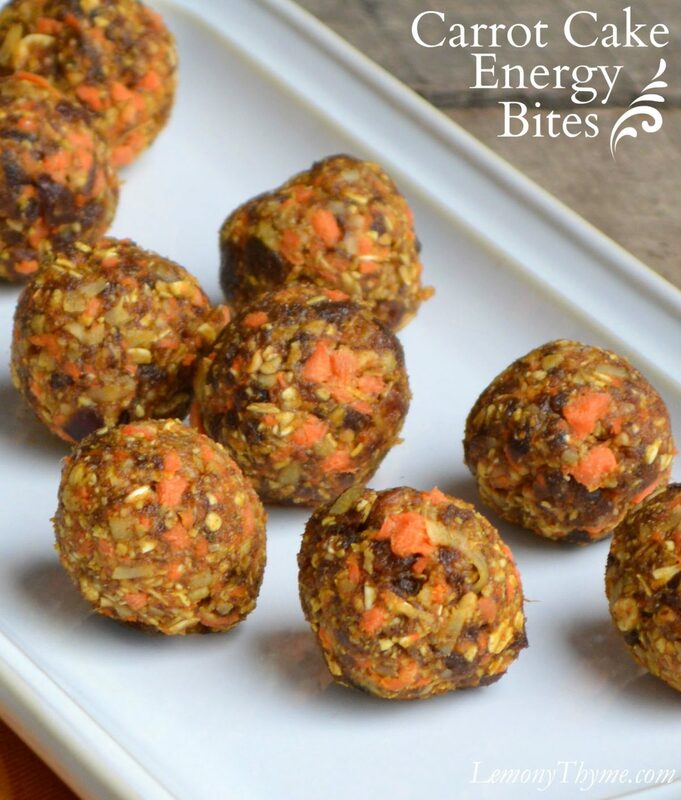 Carrot Cake Energy Bites are stored in the freezer making them a quick on the go snack. Add all ingredients to a food processor or Vitamix. Pulse until the mixture is well combined, yet with texture; about 10 times. The mixture should be sticky enough to form into balls. Form into 15 balls. Store in the freezer.